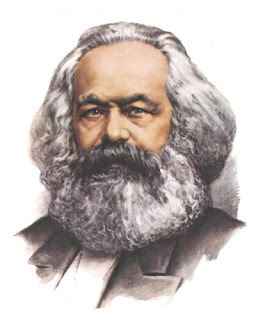 Quotes:"Democracy is road to socialism"
Note: Born into a wealthy middle class family in Trier, formerly in Prussian Rhineland now called Rhineland-Palatinate, Marx studied at both the University of Bonn and the University of Berlin, where he became interested in the philosophical ideas of the Young Hegelians. In 1836, he became engaged to Jenny von Westphalen, marrying her in 1843. After his studies, he wrote for a radical newspaper in Cologne, and began to work out his theory of dialectical materialism. Moving to Paris in 1843, he began writing for other radical newspapers. He met Engels in Paris, and the two men worked together on a series of books. Exiled to Brussels, he became a leading figure of the Communist League, before moving back to Cologne, where he founded his own newspaper. In 1849 he was exiled again and moved to London together with his wife and children. In London, where the family was reduced to poverty, Marx continued writing and formulating his theories about the nature of society and how he believed it could be improved, and also campaigned for socialism—he became a significant figure in the International Workingmen's Association. Marx's theories about society, economics and politics—collectively known as Marxism—hold that all societies progress through the dialectic of class struggle: a conflict between an ownership class which controls production and a lower class which produces the labour for such goods. Heavily critical of the current socio-economic form of society, capitalism, he called it the "dictatorship of the bourgeoisie", believing it to be run by the wealthy classes purely for their own benefit, and predicted that, like previous socioeconomic systems, it would inevitably produce internal tensions which would lead to its self-destruction and replacement by a new system, socialism.He argued that under socialism society would be governed by the working class in what he called the "dictatorship of the proletariat", the "workers state" or "workers' democracy"He believed that socialism would, in its turn, eventually be replaced by a stateless, classless society called communism. Along with believing in the inevitability of socialism and communism, Marx actively fought for the former's implementation, arguing that both social theorists and underprivileged people should carry out organized revolutionary action to topple capitalism and bring about socio-economic change. Revolutionary socialist governments espousing Marxist concepts took power in a variety of countries in the 20th century, leading to the formation of such socialist states as the Soviet Union in 1922 and the People's Republic of China in 1949. Many labor unions and worker's parties worldwide were also influenced by Marxist ideas. 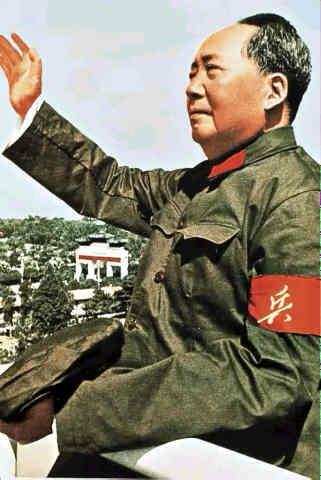 Various theoretical variants, such as Leninism, Stalinism, Trotskyism and Maoism, were developed. Marx is typically cited, with Émile Durkheim and Max Weber, as one of the three principal architects of modern social science.Marx has been described as one of the most influential figures in human history. Quotes:"A lie told often becomes truth"
Note:In Marxist philosophy, Leninism is the body of political theory for the democratic organisation of a revolutionary vanguard party, and the achievement of a direct-democracy dictatorship of the proletariat, as political prelude to the establishment of socialism. Developed by, and named for, the Russian revolutionary Lenin (Vladimir Ilyich Ulyanov, 1870–1924), Leninism comprises political and socialist economic theories, developed from Marxism, and Lenin’s interpretations of Marxist theory, for practical application to the socio-political conditions of the agrarian Russian Empire (1721–1917) of the early 20th century. 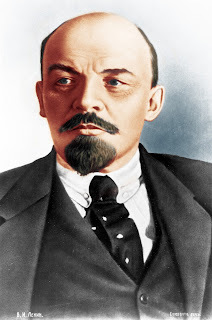 In February 1917, Leninism was the Russian application of Marxist economics and political philosophy, effected and realised by the Bolshevik party, the vanguard party who led the fight for the political independence of the working class. Functionally, the vanguard party provided the political education, and the revolutionary leadership and organisation necessary to depose capitalism in Imperial Russia. After the October Revolution of 1917, Leninism was the dominant version of Marxism in Russia, and then the official ideology of Soviet democracy (by workers’ council) in the Russian Socialist Federative Soviet Republic (RSFSR), before its unitary amalgamation into the Union of Soviet Socialist Republics (USSR), in 1922. 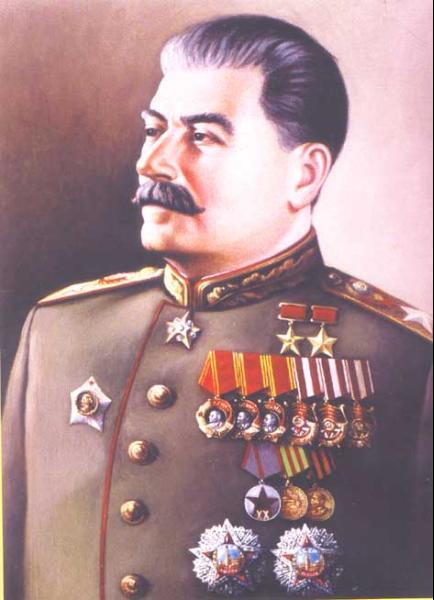 Quotes:"I trust no one,even myself "
Note: Stalinist policies in the Soviet Union included: rapid industrialization, socialism in one country, a centralized state, collectivization of agriculture, and subordination of interests of other communist parties to those of the Soviet party - deemed to be the most forefront vanguard party of communist revolution at the time. Stalinist rapid industrialization in the Soviet Union was officially designed to accelerate the Marxian development towards communism, stressing that such rapid industrialization was needed because the country was previously economically backward in comparison with other countries; and that it was needed in order to challenge internal and external enemies of communism.Rapid industrialization was accompanied with mass collectivization of agriculture and rapid urbanization. Rapid urbanization converted many small villages into industrial cities. Stalinism took an aggressive stance on class conflict, utilizing state violence to forcibly purge society of the bourgeoisie such as the Kulaks and other "class enemies", as well as claiming that class conflict existed within communist parties. Stalinism is commonly used in a negative or pejorative manner due to the known extremely repressive political actions undertaken by Stalin. The reasons for Stalin's repressive actions have been debated.One perspective claims that Stalin's repressive actions were calculated and that he was mentally sane in his execution of repressive measures.Another perspective claims that Stalin's repressive political actions were the result of him having mental illness.This claim states that Stalin likely had the mental disorder of psychopathy and that its traits such as paranoia and manipulative behavior influenced his political decisions. A third perspective claims that Stalinism's repressive actions were a continuation of the prevailing authoritarian and repressive political culture that originated in Tsarist Russia. Quotes:"Too Read to many books harmfull"
Note:Maoism is also used to refer to Mao's belief in the mobilization of the masses, particularly in large-scale political movements; it can also refer to the egalitarianism that was seen during Mao's era as opposed to the free-market ideology of Deng Xiaoping; some scholars additionally define personality cults and political sloganeering as "Maoist" practices. Contemporary Maoists in China criticize the social inequalities created by a capitalist and "revisionist" Communist party. Internationally, Maoist organizations mainly draw upon Mao's ideology of the People's War, mobilizing large parts of rural populations to revolt against established institutions by engaging in guerrilla warfare. Notable Maoist organizations and armed groups currently exist in several countries, most notably the Shining Path in Peru, the Naxalites in India, and the Communist Party of Nepal (Maoist); the latter of which is the only current Maoist party holding power through a democratic process. Maoism also pushes for an adapted version of Trotskys theory of permanent revolution. This theory, known as the theory of 3 permanent world revolutions, is a core aspect of Marx-Lenin-Maoism. Quotes:"The Revolution is not an Apple that falls when it ripe,You have to make it fall "
Unknown Information:Che had sever Asthma problem,Che is a doctor by profession and from a upper middle class family. Note:As a young medical student, Guevara traveled throughout Latin America and was radically transformed by the endemic poverty and alienation he witnessed. His experiences and observations during these trips led him to conclude that the region's ingrained economic inequalities were an intrinsic result of capitalism, monopolism, neocolonialism, and imperialism, with the only remedy being world revolution. This belief prompted his involvement in Guatemala's social reforms under President Jacobo Arbenz, whose eventual CIA-assisted overthrow solidified Guevara's political ideology. Later, while living in Mexico City, he met Raúl and Fidel Castro, joined their 26th of July Movement, and sailed to Cuba aboard the yacht, Granma, with the intention of overthrowing U.S.-backed Cuban dictator Fulgencio Batista. Guevara soon rose to prominence among the insurgents, was promoted to second-in-command, and played a pivotal role in the victorious two-year guerrilla campaign that deposed the Batista regime. Following the Cuban Revolution, Guevara performed a number of key roles in the new government. These included reviewing the appeals and firing squads for those convicted as war criminals during the revolutionary tribunals, instituting agrarian land reform as minister of industries, helping spearhead a successful nationwide literacy campaign, serving as both national bank president and instructional director for Cuba’s armed forces, and traversing the globe as a diplomat on behalf of Cuban socialism. Such positions also allowed him to play a central role in training the militia forces who repelled the Bay of Pigs Invasion and bringing the Soviet nuclear-armed ballistic missiles to Cuba which precipitated the 1962 Cuban Missile Crisis.Additionally, he was a prolific writer and diarist, composing a seminal manual on guerrilla warfare, along with a best-selling memoir about his youthful motorcycle journey across South America. 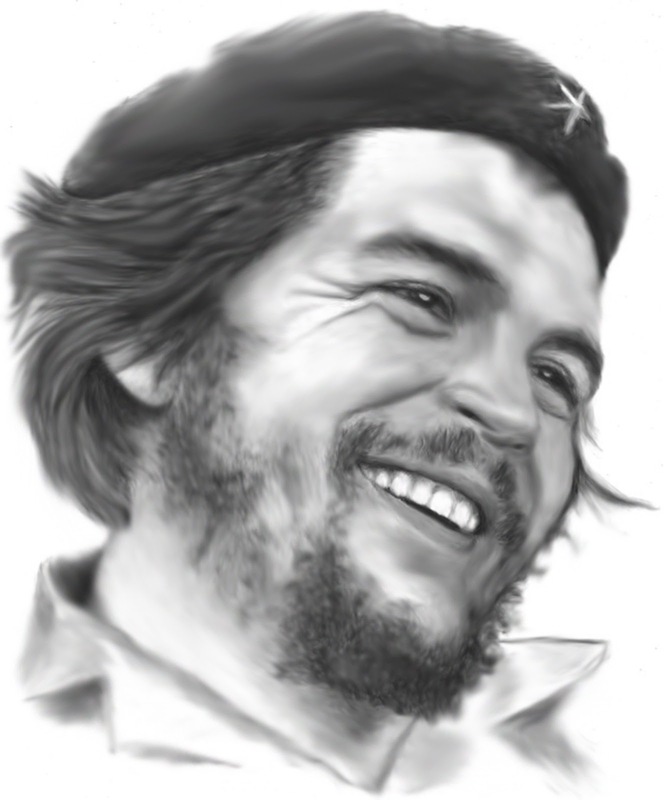 Guevara left Cuba in 1965 to foment revolution abroad, first unsuccessfully in Congo-Kinshasa and later in Bolivia, where he was captured by CIA-assisted Bolivian forces and executed. Guevara remains both a revered and reviled historical figure, polarized in the collective imagination in a multitude of biographies, memoirs, essays, documentaries, songs, and films. As a result of his perceived martyrdom, poetic invocations for class struggle, and desire to create the consciousness of a "new man" driven by moral rather than material incentives; he has evolved into a quintessential icon of various leftist-inspired movements. Time magazine named him one of the 100 most influential people of the 20th century, while an Alberto Korda photograph of him entitled Guerrillero Heroico , was cited by the Maryland Institute College of Art as "the most famous photograph in the world". maybe in the list of reactionary opportunists? I wish to be comrade and struggler like Carl max due to his enormous contributions to the success of politics and critical radicals and also as a good assets as socialism and communism. "A Complete Guide About Income Tax Return"
"Evolution Of Human Being and Life In Earth"
India:A Union and Aspirant States Of India! Three Corners Of India:Kashmir Conflicts! 10 Most Famous Internet Icons And Friendship!!! Income InEquality In India:A Major Concern!